Sony’s first attempt at consumer virtual reality, the PlayStation VR attempts to combine state-of-the-art technology with lower prices than the competition. Sony is a long-awaited player in the emerging virtual reality market, especially since it comes after the Oculus Rift and HTC Vive. The Japanese manufacturer’s headset has several advantages on paper: first, it is released on a console, the PlayStation 4, which is extremely well established in homes (more than 40 million copies sold in May 2016); it is, therefore, likely to reach many people. Secondly, it is offered at a lower price than the competition, but which must nevertheless be put into perspective. 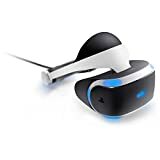 The headset isn’t too pricey, but it works with the PlayStation Camera, an accessory that has been on the market for several years, and which is used to locate the position of the user’s head in space. It is necessary to add an additional amount of money to the total price if you do not already have one. And even if they are not mandatory, the addition of two PlayStation Move allows you to make movements in space to reproduce them in the virtual world, exactly like the controllers of the HTC Vive or the future Touch of the Oculus Rift. We had already seen it when we first started using it, and this commercial version confirms it: the PlayStation VR is certainly the most comfortable reality headset to wear. In this respect, it far exceeds the competition. Thus, its weight is not the lowest (600 grams, compared to 500 grams for the Rift), it is extremely well distributed, thus offering excellent stability once the device is fixed on the head. Sony has also thought very carefully about its fastening system, avoiding the unsightly band above the head. All you have to do is slide the headband by pressing a button on the back to adapt the helmet to the head size. Once it is put on, a small knob is used to tighten the assembly. A button located under the front of the helmet increases or decreases the distance between the screen and the eyes. In practice, it is essential to stick it firmly to the face. Otherwise, it will be disturbed by strong light leaks. On this point, it is not perfect because, even once the device is firmly fixed on the head, and above the eyes, a slight light is visible at the level of the nose. However, apart from this slight defect, the PlayStation VR is a joy to wear. The area at the forehead is reinforced with a very comfortable quilted imitation leather, and the whole thing is quickly forgotten, even when wearing glasses. Sony has made every effort to simplify installation. This means connecting the box that connects the console to the headset (necessary for processing 3D audio, but also essential to help send the final rendering of the image into the headset), by connecting it to both the mains, HDMI to the TV and USB to the console. The PS4’s HDMI output will point to the box. The PlayStation camera plugs into the console. Once the console and headset are turned on, detection is automatic and a tutorial appears, both on the TV and in the PS VR screen. In a few seconds, we learn some basic functions, such as refocusing the image by pressing and holding down the “Options” button on the controller, as well as putting on the headset correctly, and that’s all. No calibration is necessary, except to wait for the camera to detect the user’s position in the room. Once the whole system is connected, it takes 5 minutes in total before you start using the PlayStation VR. The mandatory use of our thermal sensor shows excellent results, both for the helmet and the housing. So the helmet doesn’t get very hot. A maximum temperature of 31.8°C is recorded at the front. Logically, the housing is a little more subject to heating, and its fan at the back gives off a maximum heat of 38.3°C. Note that the latter consumes 18 watts in the middle of the game, which is more than acceptable. Regarding image quality, PlayStation VR is at a disadvantage compared to the competition. The definition of its 5.7-inch Oled screen is only 1920 x 1080 px, or 960 x 1080 px per eye. Which is less than the Rift or the Vive, which go up to 2160 x 1200 px. The field of view is also only 100°, when the others reach 110°. Sony, on the other hand, uses a technique called “reprojection” which calculates a display at 60 frames/second, then artificially doubles this figure to 120 frames/second, an ideal display frequency for a pleasant virtual reality experience, free of any nausea effects. It also theoretically allows developers not to have to make too many compromises on game rendering, since they only need to reach “only” 60 frames/second. In practice, the image displayed by the PlayStation VR has as many qualities as it has defects. The fluidity is impeccable and prolonged use is therefore quite possible. We were also pleasantly surprised by the lack of grid effect, especially since we are still on Full HD. The texts are very clear, and no frame is visible in the background once care has been taken to ensure that the screen is properly positioned. It is necessary to point out the serious graphic degradation shown by the vast majority of the games tested. An aliasing – or staircase effect – that is visible on most textures gives the impression of having moved backwards by a good generation of consoles. We are faced with titles that seem to have come from the early days of PlayStation 3. However, this is not a surprise in itself, but the reality is there: PS VR games are, on the whole, all pretty ugly. But fortunately, this does not prevent some of them from being very effective – we will discuss this later). We also applied our probe to the helmet screen (or rather to its lenses) and measured very good results: almost infinite contrast due to the use of the Oled, very stable gamma curve (sign of an impeccable grayscale), delta E at 4.2 and colour temperature at 6895 K. These last two digits are a sign of satisfactory colourimetry, with fairly accurate colours and a balanced rendering, neither too hot nor too cold. Instead of an integrated audio system, as on the Oculus Rift, the PS VR is available with a pair of in-ear headphones, which connect to the jack port located on the headset remote control. Of course, there is nothing to prevent you from using another audio system. These intras have a very basic construction quality, with an exclusively plastic frame and a very thin cable. In terms of comfort, they are far from comfortable but remain wearable for game sessions not exceeding two hours. They are not very intrusive and isolate quite well from outside noise. However, as no other pair of silicone ear tips is provided, ear holding and comfort may vary depending on the morphology of the ear canal. On the other hand, these small intras surprise us a little more regarding sound performance. They are much more pleasant than the headphones provided with the console. Basically, with the intras well inserted, the low frequencies are too wide and mask the higher frequencies. To restore a little balance and gain overall clarity, simply push them a little less into the duct to find the right balance between bass, ear hold and isolation. The result is a relatively homogeneous, more striking and much more pleasant rendering. The voices are well intelligible and clear, as are most sources. The distortion remains discreet over the rest of the audible spectrum, the stereophony is wide and the sound immersion satisfactory. We will finally try to answer the simple, but crucial, question: does the PlayStation VR deliver a good virtual reality experience? As we have seen above, ergonomics is one of the strong points of the headset. Sony has thought through its product down to the last detail and has done everything possible to ensure that the average user enters the VR quickly and efficiently. Once the headset is on, you find yourself facing a second screen, which displays the classic PlayStation 4 menu. You can then launch any game easily and enjoy it in “very large diagonal” mode. Keeping the same interface as on the TV is a good idea and makes you feel immediately comfortable. The purchase and download of compatible games are done in the classic way via the PlayStation Store. They launch themselves exactly like any PS4 game. The London Heist and Until Dawn: Rush of Blood, for example, are two shoot-on-rail games that take advantage of the two motion recognition controllers and deliver a satisfying, but not flawless, experience. The accuracy is far from that proposed by the HTC Vive controllers, and it will regularly be necessary to deal with small calibration problems and other positioning bugs – a hand that is at the top of the screen. However, embarrassing problems remain rare, but the fact is that PlayStation Move – released in 2010 and therefore based on a technology that is several years old – have difficulty competing with newer controllers, specifically designed for virtual reality. On the other hand, it must be said that the PlayStation VR is very convincing as soon as you use it in a calm, pad-in-hand way and it is possible to use it for several hours at a time. It is undoubtedly the sum of the small details mentioned above (comfort of use, ease of navigation in the menus, impeccable fluidity of the games) that allows Sony’s headphones to compete with their competitors, despite a technical sheet in the background. The PlayStation VR compatible games catalogue is already relatively extensive and we have selected three titles that we particularly liked. For more detailed information on the rest of the production, don’t hesitate to visit our excellent Gamekult colleagues. If you own a PlayStation 4, you may have already played Until Dawn, a very cinematic adventure game based on many horror movies. This side episode takes up part of the game’s universe and puts us in a wagon for a ghost train ride that is quite anxious as it should be. Here, the PlayStation Move is used as weapons, and it is a matter of shooting the spectrum and the psychopathic killer at all costs. The “jump scare” type effects are frequent, sometimes a little predictable, but you get caught up in the game very quickly. PlayStation VR Worlds is, a little like The Lab for the HTC Vive, a collection of games and experiences that are quite short, but for the most part very successful. Discovery of the seabed with a bonus shark attack, sled simulation – where you have to move your head to find your way around -, exploration of an alien ship carcass in the skin of a giant robot – the very nice Scavengers Odyssey – but above all The London Heist, a real little interactive film filled with gangsters with a very handy tongue, where robberies and chases are very effective game phases. A very good introduction when you first discover the helmet. This is perhaps the most immersive game available on PlayStation VR, yet it is one of the most minimalist. With its psychedelic graphics and hypnotic electro soundtrack, Thumper takes us on board very quickly to keep us busy. It is a very simple matter here to make the right key combinations at the right time, all in rhythm with the music. A mix between a shooting game and a shoot’em up, Thumper should please those who liked REZ or Audiosurf. A very comfortable helmet to wear. Also serves as a second screen for the PS4. The precision of the PS Move can be improved. Aliasing highly visible in games. PlayStation Camera and PS Move sold separately. Sony’s first attempt at virtual reality is a success story based on a few arguments: an ultra-comfortable headset that is easy to install and use, that offers a pleasant experience. The Japanese manufacturer has decided to reuse old technologies (PS Move, PS Camera) that have been somewhat neglected, but which find their place here, even if the controllers deserve to be more precise. So yes, most games are pretty disappointing graphically, especially compared to what the PS4 is usually able to release, but the fact is that immersion works 100%, and that’s the most important thing.